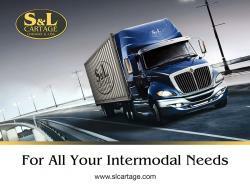 S&L CARTAGE INC. IS AN INTERMODAL TRUCKING COMPANY LOCATED IN CHICAGO, IL. WE HAVE WORKED HARD TO EARN REPUTATION OF BEING ONE OF THE MIDWEST'S BEST LOGISTICS PARTNERS AND WE PRIDE OURSELVES ON PROVIDING EXCELLENT AND THE MOST RELIABLE LOGISTICS SERVICES THAT CUSTOMERS CAN COUNT ON. WE UNDERSTAND OUR CUSTOMER’S EXPECTATIONS AND WE WILL DO WHATEVER IT TAKES TO MEET THOSE EXPECTATIONS. We understand that cost, time and safety are the main concerns for our customers; therefore, we thrive to do our job in the quickest, most cost-efficient and reliable way for you and your customers. The cornerstone of our daily operations is that it takes weeks, maybe months to get a customer, but it can take only one bad day to lose one. So far, we are proud to maintain 100% customer satisfaction – meaning that all customers that used our service for the first time, returned to us ever since. First – Our Customers: We know that ultimately everything depends on the response and service that we provide to YOU, our customer. That is why the customers that have used our service, even for only one time, will always come back to us. What we thrive to provide is not only a rate and a truck to haul your goods, but also the human contact and the certainty that we care about your business and understand what crucial role the prompt transportation both import or export plays in it. Second – Our Staff: It is only due to the commitment and hard work of the people that work for us that we can maintain the promises we make to you, and we pledge with you to offer our efficient service only because we know who our staff is and what we can do for you.